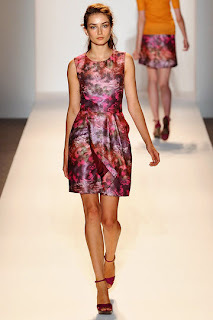 'Lela Rose Spring 2010 centers around the sun faded palette of Alex Katz and the splashes of saturated color seen at Venice Beach. Combining texture of color, silhouettes resemble sculpted surf wear while soft wave and cascade shapes bring an ocean feel to the collection. Wrapped skirts, seamed sheaths , and sport jackets are redefined through sunset tweed, matte stretch linen and daybreak printed cotton. There are many pieces that work well for a petite frame, including a rolled neck blouse, cashmere cardigans, scuba and wave skirts, sheath, halter, and strapless dresses. Bently is inspired by the classic '50s round-toe pump and modernized with a weighted covered heel and twisted bow detail. The Bently is featured on the runway today in several interesting textures and fabrics such as citrine "splash" jacquard, dove grey-and-sand "scratchy-dot" silk, royal navy linen and magenta faille. Ashland is a peep-toe mary jane with a sculpted wedge heel. The wedge heel is inspired by the waves of the ocean and done in sand-colored lacquered wood to exude a watery shine feel. The upper is detailed with an angular peep-toe and simple mary jane strap and accented by an oval nickel buckle. The Ashland is featured on the runway today in a range of fabric uppers including the "scratchy-dot" jacquard, bright navy and ivory ticking tweed, sea grass cotton tiny dot, royal navy and koi orange linen, and magenta faille. Hampton is a wedge featuring the same sculpted sand-colored heel design as the Ashland, complemented with a wide criss-cross fabric upper design. This style goes down the runway in strong colors such as sea grass green, royal navy and dove grey linen. This style is also represented in royal navy linen combined with ivory ticking weed, exemplifying Rose's signature mixed material design aesthetic. Neilson is the only flat in the collection. Designed as a classic skimmer silhouette, the soft pointed toe and twisted bow detail make this style a wardrobe staple. The Neilson is seen in the sea grass cotton tiny dot and citrine faille. Kinney is the dressy open-toe platform pump. It features a visible three-quarter-inch platform sole that is designed to incorporate the three adjoining toe straps. The ankle strap is "belted" across the heel counter and secured with a square nickel buckle. This style is featured on the runway in colored silk satins including bright navy, classic navy, ivory and dove grey. Zephyr is a casual spring sandal that includes the sculpted sand-colored lacquered wood wedge heel, a simple cross-band design across the toe, and a feminine ankle strap. This style is seen today in wonderful textured fabrics that include the "scratchy-dot," the citrine "splash" jacquard and the sea grass mini-dot cotton. 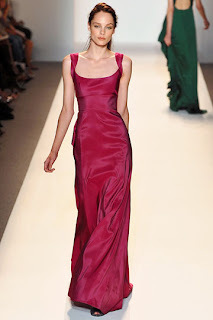 It is also represented in bright navy silk satin and magenta faille.